Do Alzheimer’s proteins share properties with prions? This is the proposal that deposition of amyloid-beta, a major protein ingredient of the plaques that accumulate in the brains of Alzheimerâ€™s patients, is a central event in the pathology of the disease. Lots of supporting evidence exists, but several therapies that target beta-amyloid, such as antibodies, have failed in large clinical trials. In a recent Nature News article, Boer Deng highlights an emerging idea in the Alzheimerâ€™s field that may partly explain why: not all forms of aggregated amyloid-beta areÂ the same. Moreover, some â€œstrainsâ€ of amyloid-beta may resemble spooky prions in their ability to spread within the brain, even if they can’tÂ infect other people (important!). Prions are the “infectious proteins” behind diseases such as bovine spongiform encephalopathy. TheyÂ fold into a particular structure, aggregate and then propagate by attracting moreÂ proteins into that structure. Lary Walker at Yerkes National Primate Research Center has been a key proponent of this provocative idea as it applies to Alzheimer’s. 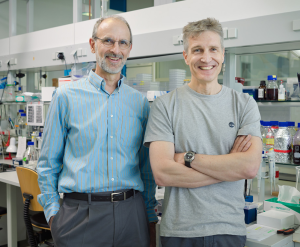 To conduct key experiments supporting the prion-like properties of amyloid-beta, Walker has been collaborating with Matthias Jucker in TÃ¼bingen, Germany and spent four months there on a sabbatical last year. Their paper, describing how aggregated amyloid-beta is â€œseededâ€ and spreads through the brain in mice, was recently published in Brain Pathology. Walker notes that this unusual case was discovered by former graduate student Rebecca Rosen, now a science policy researcher. Graduate student Amarallys Cintron (who defended her thesis Monday) has been working on this topic as well. Walker was quoted by Alzforum commenting on a recent Cell Reports paper describing two classes of amyloid-beta â€œoligomersâ€ (small aggregations of protein that are still soluble) with different structural properties. See here for more on Emory researchers’ efforts to go “beyond the usual suspects” in Alzheimer’s research.